Happy Sunday! 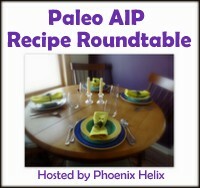 I wanted to do a little positive review today for a great new AIP resource! One of the top AIP food bloggers, Michelle of Unbound Wellness, has released the “30 Day Autoimmune Makeover Guide.” I’ve had a look, and I gotta say, I love it! It’s absolutely gorgeous, has delicious and uncomplicated recipes, and includes 30 days of meal plans and shopping lists. The Autoimmune Makeover Guide approaches the AIP in a Whole30 style, while breaking down into understandable terms everything you need to know about the who/what/where/when/and how of implementing the Autoimmune Protocol. Whew!